The Packwood House is located in the center of the quaint historic village of Skaneateles on Genesee Street (half block from Sherwood Inn). Contemporary design lakefront lodging with convenient in-room amenities including kitchenettes and hi-speed internet access. 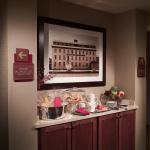 Several guestrooms feature over sized balconies and jacuzzi tubs overlooking Skaneateles Lake.